Our programs are offered in Hebrew, free of charge, and are open to all who are interested. Teachings are presented in a way that is immediately relevant to the students' daily reality, while being deeply rooted in classical Buddhist scriptures that were preserved by the ancient lineages of Tibetan Buddhism. The teachings are intended to contribute to our happiness and to the happiness of others, through a personal experience of the world-view of Mahayana-dharma, and their ultimate goal is to bring us closer to enlightenment. The material we study in our courses parallels the material covered in the curriculum of Tibetan Buddhist monasteries of the Gelugpa tradition, which upon completion award the successful monk with a Geshe degree (somewhat parallel to a Doctor of Philosophy). This course of study is now being offered in the West through our courses and meditation modules, and is now being offered for the first time in Hebrew. The program provides a comprehensive and thorough study of the open teachings of Tibetan Buddhism, and prepares its students to the study of Buddhist Tantra. When practiced under the guidance of a qualified teacher, Buddhist Tantra is considered the quick path to total enlightenment, allowing full attainment of Buddhahood even in this lifetime. First of its kind in the West, This program was compiled by Geshe Michael Roach, an American-born Tibetan Buddhist monk, who was among the first Westerners to complete the entire course of studies in a Tibetan Buddhist monastery, and receive the title of Geshe. Inspired by his lama, Ken Rinpoche Geshe Losang Tarchin, former abbot of the renowned Sera Mey monastery, Geshe Michael started the Asian Classics Institute in New York, and had trained a group of teachers who now offer the ACI courses throughout the world. 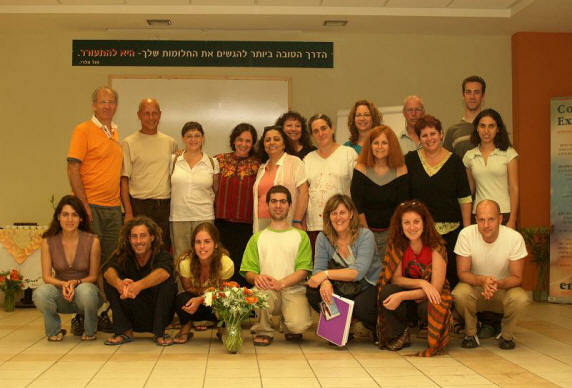 During Lama Dvora's visits in Israel, our studies are conducted through direct contact with her. In other times, the courses continue via video-conferences through the Internet, which are simultaneously broadcast from the U.S. (where Lama Dvora resides) to several locations in Israel. We currently have study groups in the northern part of the country, in Tel Aviv, and near Jerusalem. To accommodate Israeli students, a significant effort is being made to provide Hebrew translations from the Tibetan language of original ancient texts, with strict attention to precision and quality of expression in Hebrew. In many cases these translations are first of their kind, and we are happy to offer them to the Israeli public through this website. We intend to extend and further encourage this activity, for our own benefit and the benefit of future generations. It is extremely rare in this world to meet original dharma teachings coming from a pure and authentic tradition, that are delivered through a spiritual lineage of highly attained teachers. We are grateful for the opportunity to receive those teaching in our country and in our native language, and for the possibilities that those teachings hold for us. We are grateful to our teacher Lama Dvora-Hla who is providing us with continued guidance, with much wisdom, a rare talent for teaching, with endless enthusiasm and great love. We receive with gratitude her superb translations of original texts. We will do our best to be worthy of this precious gift. This site was established as an expression of this sentiment. Its purpose is to serve as a place to meet and exchange information between friends who study and practice dharma, and as a place to find materials and texts in Hebrew, as well as in English and Tibetan. It will also provide information about activities and teachings by Lama Dvora. Our activities are made possible through donations, and all teachings and supporting efforts are done by the kindness of volunteers. If you wish to receive more information please join our mailing list, or you may contact us.